The press release posted here was jointly issued by the City of San Francisco, the California Council of the Blind, the LightHouse for the Blind and Visually Impaired, and the San Francisco Independent Living Resource Center. The City has now exceeded the obligations of a 2007 agreement reached using Structured Negotiations and, as announced below, has installed Accessible Pedestrian Signals (APS) at 116 intersections. There are over 1,000 devices installed at these 116 intersections and San Francisco has plans — with federal stimulus funds — to install APS at additional intersections. Special appreciation to Cristina Calderon Olea, San Francisco Municipal Transportation Agency (SFMTA) staff for commitment and leadership in implementing the historic San Francisco APS agreement. San Francisco (March 24, 2010)–The San Francisco Municipal Transportation Agency (SFMTA), which oversees all surface transportation in San Francisco including the Municipal Railway (Muni), today announced that the City has received federal stimulus funds that will equip five additional intersections with Accessible Pedestrian Signals (APS). In the City 116 intersections have been equipped with the devices over the past two and a half years, making San Francisco the national leader on this important safety issue. The APS installed by the SFMTA meet new federal guidelines issued in December. The state of the art signaling devices assist pedestrians with visual impairments by emitting a rapid ticking sound in tandem with the familiar WALK symbol displayed for sighted pedestrians. Other accessibility features include locator tones to help those with visual impairments find the devices, vibrating push buttons during the walk phase and audible information such as street names when pedestrians press the push buttons for one second or longer. “The audible and tactile information conveyed by the APS has helped eliminate my fear of crossing intersections in San Francisco,” said David Jackson, a blind, 30-year resident of San Francisco and a Board member of the California Council of the Blind. San Francisco’s APS program also includes a detailed checklist for prioritizing requests for APS and a carefully monitored maintenance program. Members of the public can request that the signals be installed by either visiting 311.org or calling 311. The SFMTA’s successful APS program grew out of a cooperative effort between blind advocates from the California Council of the Blind, the LightHouse for the Blind and Visually Impaired and the Independent Living Resource Center San Francisco. 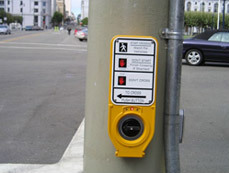 The SFMTA and the California Council of the Blind reached a landmark settlement on the issue in 2007. The SFMTA continues to pursue opportunities to expand the APS program. The original agreement included at least 80 intersections. Going forward the SFMTA will continue to work with the community to expand the use of APS. Established by voter proposition in 1999, the SFMTA, a department of the City and County of San Francisco, oversees the Municipal Railway (Muni), parking and traffic and taxis. With five modes of transit, Muni has approximately 700,000 passenger boardings each day. Over 35,000 extra vehicles enter San Francisco on any given business day, and rely on the SFMTA to keep the flow of cars, transit vehicles, taxis, delivery trucks, pedestrians and bicycles moving smoothly through the streets. 2007 Accessible Pedestrian Signal Settlement Agreement This agreement was reached without litigation using the Structured Negotiations process. Read more about Structured Negotiations. Previous Previous: Iris Scanner Protects Medical Records – But What if You Don’t Have an Iris? Next Next: All 18,000 Bank of America ATMs are now Talking ATMs!